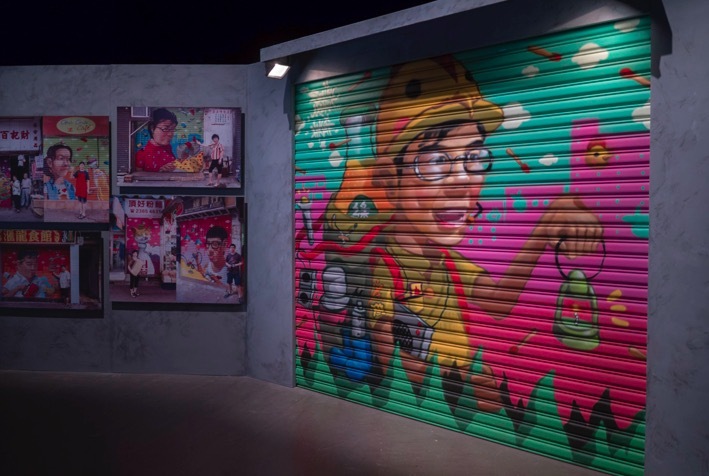 Be quick… head to the ArtisTree in Tai Koo to see a great little exhibition (which is free!). 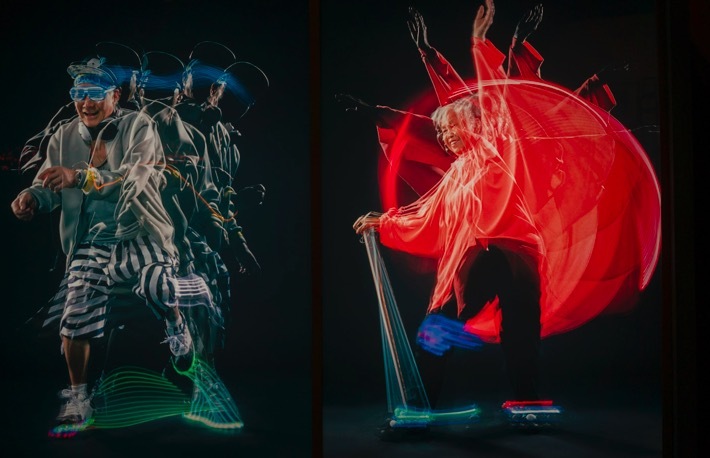 The Jockey Club Community Arts Biennale is in its second edition, and I really enjoyed it! The show is on until July 24 and runs from 10am to 8pm everyday. 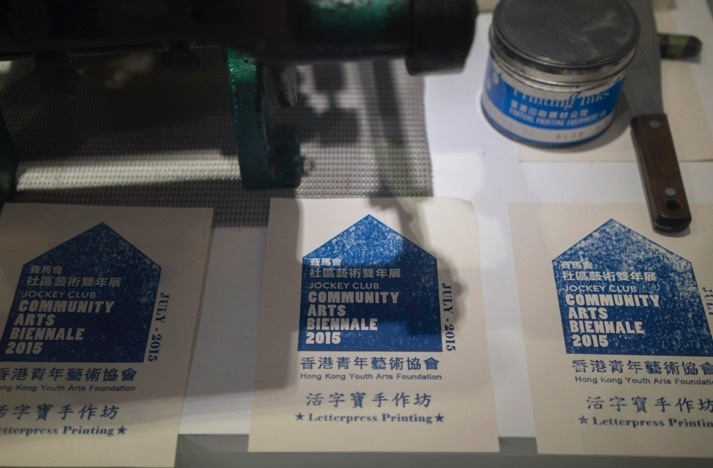 24 local professional artists worked with thousands of young people to create artwork that captures the spirit of Hong Kong – the show features artwork that is linked to old crafts of Hong Kong, such as the neon sign industry, paper craft, letter press printing and Guangcai porcelain. The other section of the show concentrates on collective memories, linked to the areas of Sham Tseng, Kwa Wan and an old village in Fanling. 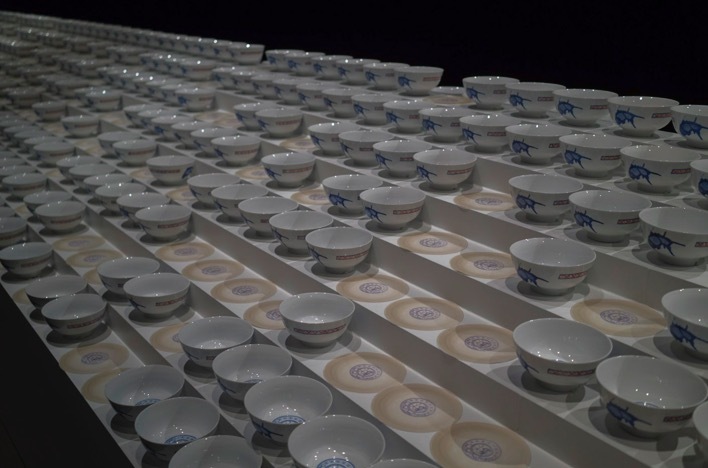 Upon entering the show, the first thing I noticed was rows of white bowls – which form part of the “One Bowl, One Promise” display. 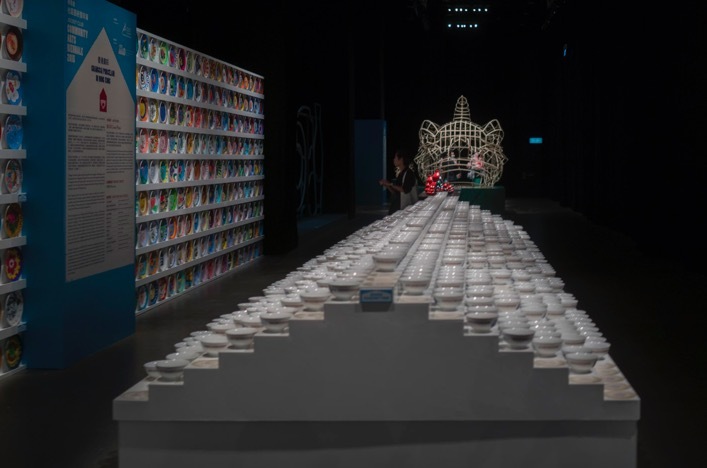 The exhibition features one thousand rice bowls painted with traditional patterns by one of the few remaining Canton porcelain painters in Hong Kong, Mrs Lam of Chiu Kee Porcelain on Peng Chau. 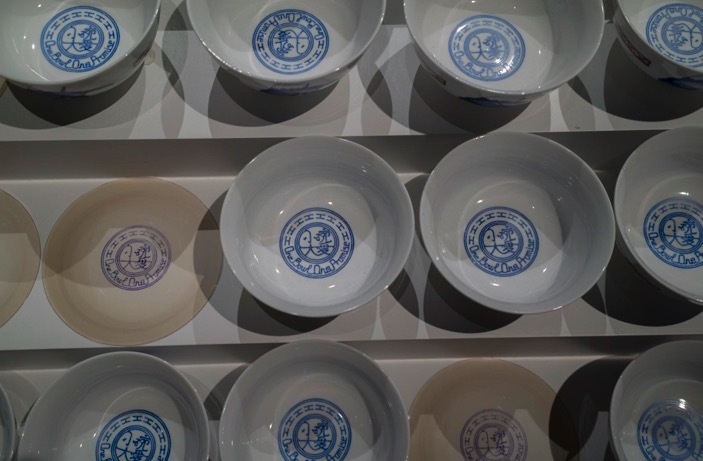 On the base of each bowl is a simple promise or pledge to the community, and visitors who pledge to honour one of these promises and document their good deeds will be given the corresponding bowl to take home. 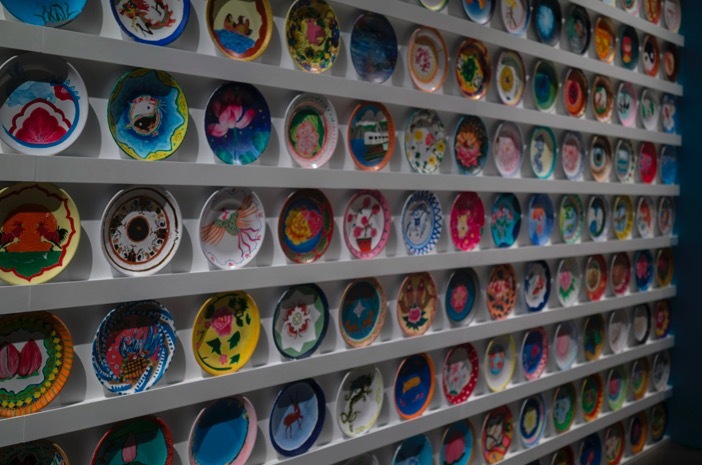 Next to the plain white bowls are plenty of colorful ones – all in the style of painted porcelain from Guangzhou. Four hundred primary and secondary school children learnt this technique and used it to create their own auspicious patterns on plates! 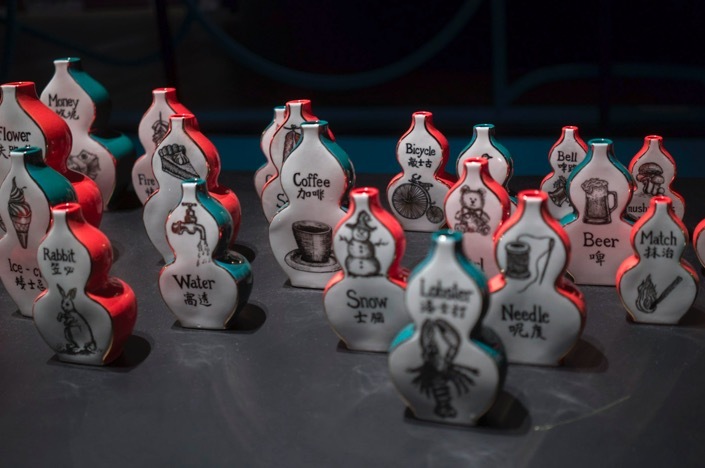 Then there are porcelain shapes in the form of half bottles – from one side they look like normal bottles in red or green, on the other side is an English word, its Cantonese translation and a picture. I didn’t get it first, but this is linked to an annual local publication that’s called Tung Shing almanac, which the older generation kept at home. Every issue includes a section with Cantonese transliterations of simple everyday English conversations, to help local people communicate with foreigners. The artist Winus Lee has interpreted this – using a Chinese “Hulu”, which is not a bottle, but in fact a bottle gourd! 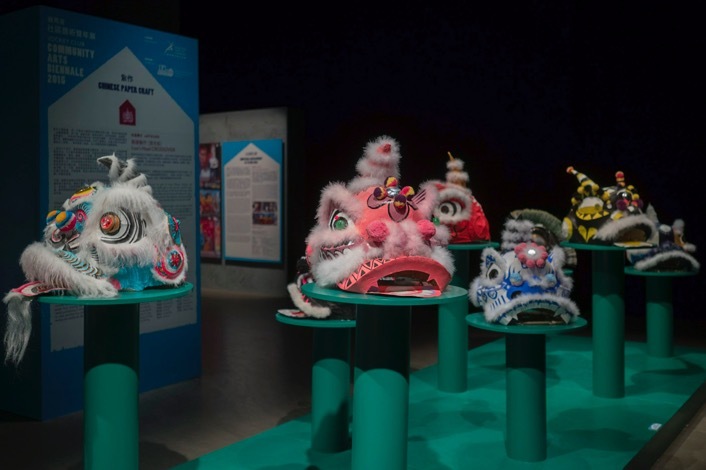 Lion dance performances are part of many Chinese festivals and celebrations – and this time a group of young students created an installation of a 2.5m tall lion head plus plenty of smaller ones! Graffiti Shutter Art is the next project – together with the Hong Kong graffiti team Smile Maker, more than a dozen students visited the To Kwa Wan community, talked to shop owners and residents and used the information to create paintings on the shutters of nine neighbourhood shops. Neon signs flourished in Hong Kong until the 1980s, but today there are less than 10 neon sign makers practising in Hong Kong. 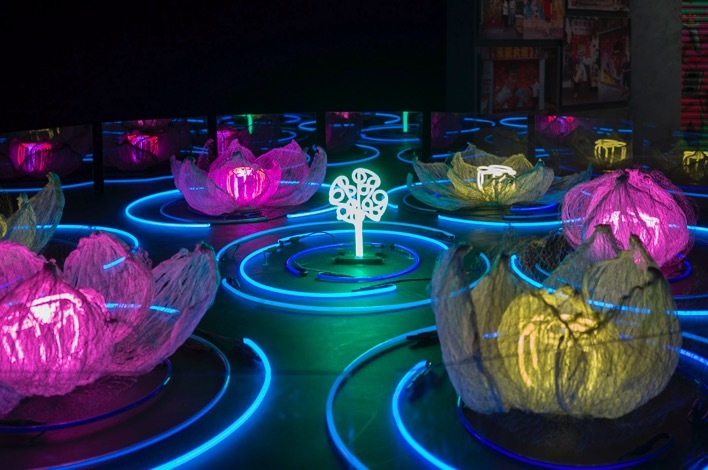 The artist Violet Shum repurposed old materials and created a lotus pond, which shows the seven stages in the life of a lotus plant and represents the cycle of nature – what a suitable theme for recycling old materials! 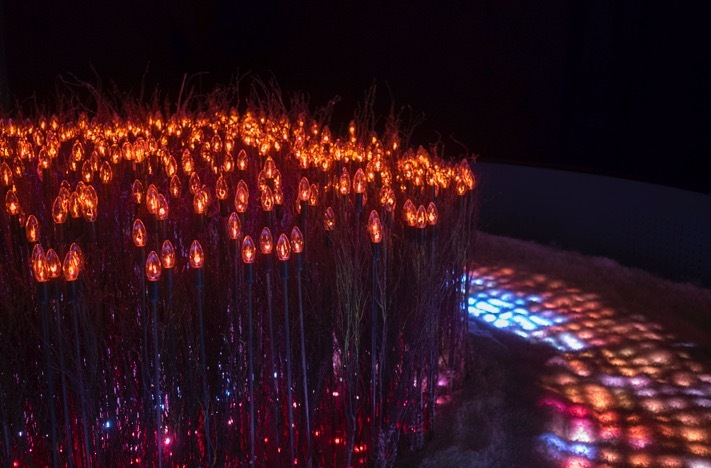 Flaneur is an artwork for the urban explorer – it invites visitors to stroll around the traditional red altar light bulbs and to reflect on life in general. 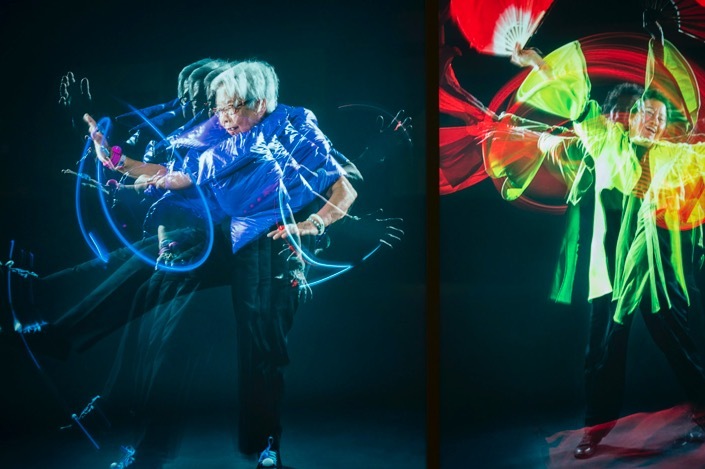 These pictures are part of a series of illuminated fashion created by the youth for a group of elderly. A group of secondary students visited the To Kwa Wan community to meet, talk and dance with elderly residents. 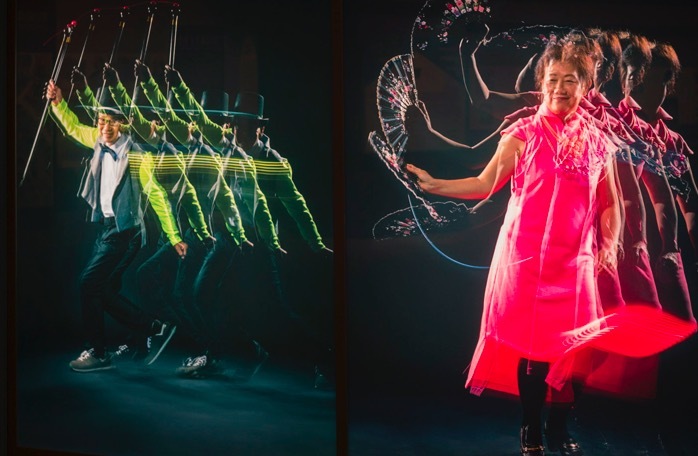 After sharing their stories and taking about their aspirations and memories, special glowing costumes were tailor-made for them. These include a magic hat, knee pads that prevent pain etc. Wearing those costumes, the participants told their stories confidently in front of the camera. 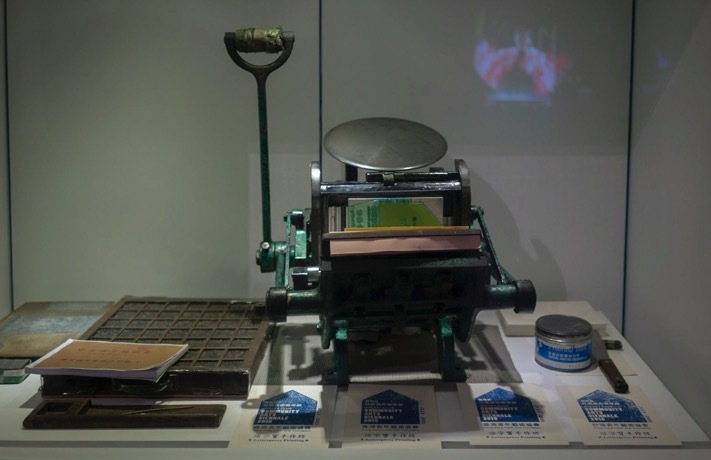 During the duration of the exhibition, there are also workshops in letterpress printing and porcelain painting – unfortunately I was too late to register and also too late to receive a bowl of the “One Bowl, One Promise” project. Maybe you’ll have more luck than me when you visit the show?